A cash-strapped council has imposed emergency spending controls for the second time this year. A letter sent to councillors says the authority "knowingly adopted unachievable savings" in 2017-18. It says the council thought it would get "fairer funding" in a review. The issuing of a section 114 notice follows an issuing of the same notice in February. Two government-appointed commissioners are overseeing the authority, with one calling its finances "truly perilous". The council is facing a potential budget shortfall in the current financial year of between £60m and £70m, according to executive director of finance Mark McLaughlin. A letter sent to members of the county council by Mr McLaughlin says the financial situation the council finds itself is because of "poor or ill-advised decisions taken" between 2014 and 2017. The letter says the council "knowingly adopted unachievable savings as part of the budget" in 2017-18 and assumed a future review would provide "fairer funding" for the council. Mr McLaughlin says he is "not able to offer remedies". He says the forecast for 2019-20 budget is "equally stark" with a further £54m of savings needed. The letter adds that with "no immediate remedy" available the section 114 notice was likely to remain "in place for the foreseeable future" and that legal advice was being sought on the "legality of the council's ongoing situation". Council leader Matthew Golby said the financial challenge facing the authority "remains critical" and the spending controls would see "limited funding" focused on "only the most essential services". The decision to issue a second notice was made in discussion with commissioners Tony McArdle and Brian Roberts, the council said. The Conservative-led council's first section 114 notice in February was believed to be the first issued in more than 20 years. 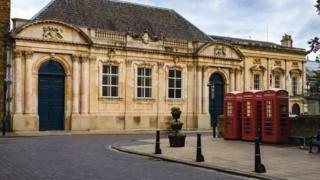 Shadow communities secretary Andrew Gwynne MP said: "Northamptonshire is a perfect storm of local mismanagement and the crushing pressures of austerity. "Commissioners will have no option but to slash and burn local services but it's the people of Northamptonshire that will be forced to pay the price for this neglect." With so many stories about councils in financial difficulties it is easy to think they are all the same. But Northamptonshire County Council is on another level. In February it became the first local authority for almost 20 years to warn it may not meet its legal obligation to balance the books for the last financial year. We still don't know if it managed it and it's already repeating the warning for this financial year. Finding the shortfall of £60-70m will mean more job losses and service cuts. In a statement, commissioner Mr Roberts said the latest notice "underlines the truly perilous state" of the authority's finances. "We have been very clear that we did not arrive in Northamptonshire with additional money," Mr Roberts said. "To put itself on a secure financial footing very difficult decisions will need to be taken. It is clear the time for these decisions is now. "All that is required of the council is that it lives within its means, just like every other council." An extraordinary full council meeting will take place on Wednesday 1 August, with the aim of discussing a new set of spending priorities. A council source suggested to the BBC the scale of possible cuts was "huge...completely unprecedented". "If the government bailed them out it would open the floodgates for other councils across the country in a similar position to come forward," the source added. A Ministry of Housing, Communities and Local Government spokesman said: "It is essential residents are able to have faith in their council, particularly in the responsible use of taxpayers' money. "These commissioners will continue to work closely with the council as it takes the necessary steps to rebalance its finances."